Ehrhart's Mill Historic District lies along Old Mill Road beside the Saucon Creek in a shallow valley in Lower Saucon Township. It is a small district that stretches about 1,000 feet northwest from the Old Mill Bridge, which crosses the Saucon Creek, to the Ehrhart farmhouse. The district consists of several buildings, contributing structures and sites. Up until June 1995 when it burned down, the largest resource in the district was the former Ehrhart Grist Mill, which was re-built following a fire in 1865 and operated continuously by the Ehrhart family until the 1950s. The Sarah Ehrhart retirement house is located northeast of the mill house. It is a c. 1890 two and one-half story brick building with a gabled roof. The Ehrhart farmhouse, located at the northwest end of the district, is a gable roofed, two and one-half story rubble limestone building built in c. 1850. The remaining structure in the district is the Old Mill Bridge, located at the southeast end of the district over the Saucon Creek. The bridge is one of the earliest dated iron Pratt Truss bridges known in Pennsylvania. The bridge was closed to vehicle traffic in 1983 and deeded over to the Township in 1988. The district was first developed as a mill site in the mid-eighteenth century by Christian Boeydler, one of the many German immigrants who settled in the area. The property in the district was sold by Boeydler in 1751, passing through several families until 1820, when Joseph Ehrhart, Sr. acquired the mill and property. The Ehrhart family expanded their holdings in the district as their milling business prospered. Much of this prosperity stemmed from ready access to raw materials (wheat) and markets for their finished product (flour). In 1856 the North Penn Railroad constructed a rail line through the district which connected Allentown and Bethlehem with Norristown which enabled Ehrhart to import grain from wheat farms in the Midwest and export flour to an expansion of regional markets. In 1867, Northampton County built Bridge #16 (Old Mill Bridge) over the Saucon Creek which gave the Ehrhart family access to grain and markets to the south and east. The Ehrhart's and their descendants continued to operate the mill until 1959 when it was sold to Bethlehem Steel. 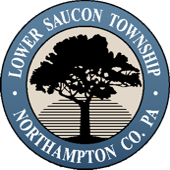 The largest resource in the district, and the heart of the district, is the grist mill located between Old Mill Road and the Saucon Creek. The mill building is a five level, three story edifice, 40 x 55 feet. It has limestone rubble walls, except for a clapboard covered frame south gable, and a slate covered gambrel roof. The stone walls were constructed by the early nineteenth century. The gambrel roof and much of the rest of the exterior were constructed in 1865 shortly after a fire destroyed much of the upper stories of the mill. The gambrel roof replaced a lower gable roof. The north (front) facade is three bays wide with single, double hung, wood framed windows flanking a wood framed door on the first and second floors. A similar third floor door and a catshead top this facade. On the west elevation, three bays of double hung, wood framed windows pierce the first and second floors. Two bays of similar windows punctuate the center and left side of the first and second floors on the east elevation. A cut sandstone arch for the tailrace anchors the lower left corner of this facade. On the south elevation, five double hung, wood framed windows pierce the first through third floors. Two double doors with stone relieving arches open to the lower basement level at the bottom of the south facade. The entire building is topped by a cross gabled cupola with windows in each end. The interior of the grist mill features heavy beams and columns, and is packed with milling machinery. Oak 9 x 10 inch chamfered columns support 10 x 11 inch axial beams into which oak and chestnut 3 x 8 inch joists are mortised. Three rows of columns divide the interior into four bays; center columns stand on stone pads in the basement while flanking columns rest on stone walls in the basement. Floors are made of hardwood planks. On the south end there is a 42 inch leffel turbine in a deep pit at the lower level of the basement. This turbine replaced an earlier water wheel about 1900. The turbine is connected to an iron great spur wheel, 9 x 3 in diameter, with an iron axle and a bevel gear beneath it. The power train in the basement is supported by a massive hurst frame 13 feet square by 8 feet high. This fram probably pre-dates the 1865 fire. The milling machinery on the first through third floors dates largely from 1865 to the 1880s, when the last major additions to the machinery were made. On the first floor are three run of 48 inch mill stones engaged to the great spur wheel below by pinion gears. A fourth mill stone was removed about 1900. On the third floor are two Silver Creek 1145 No. 2 Disintegrating Centrifugal Reels. A hammermill, various pieces of processing equipment, wood screw conveyors, hoppers, barrels, winches, gears and shafting are found throughout the building. The equipment on all three floors is connected by a bank of four double elevators that descends to the basement. Six other sets of elevators are placed throughout the mill. Attached to the grist mill is a grain storage and feed store building. It is a three story, 24 x 36 foot post and beam edifice built on stone basement walls in the late nineteenth century. It has a gable roof with a large dormer on the north side. This dormer has a loading door directly below a catshead containing a pulley. A wide cantilevered roof projects out over a loading dock on the north facade. The cantilevered roof has a trap door directly beneath the dormer so that goods could be hoisted between the loading dock and the dormer loading door. Two doors flanked by three single, double hung windows pierce the north facade just above the loading dock. The east facade has two double hung windows on the second and third floors, and a door in the left side of the basement. The south elevation features four casement windows on the first and second floors above a fifteen foot stone basement wall. 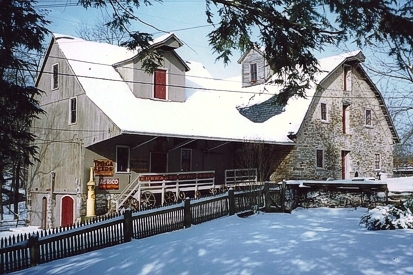 During the late nineteenth and early twentieth centuries the Ehrharts operated the largest grist mill along the section of the Saucon Creek within Lower Saucon Township. This section of the creek constituted a prominent milling area in southern Northampton County. During the late nineteenth century seven grist mills, four saw mills, a paper mill and a woolen mill were located on the two and one half miles of the creek within the township. Six smaller grist mills had been constructed along the stream in Lower Saucon Township by the Civil War. One of these mills, the Wagner Mill located on the Lower Saucon Township-Hellertown border, was the only mill that rivaled the Ehrhart Mill in terms of production. Judging from what little remains of the milling equipment in the Wagner Mill, this mill used three mill stones to produce as much as forty barrels of flour a day in the late nineteenth century. The Ehrhart Mill had four stones that could manufacture up to fifty barrels per day. Of the seven mills that originally ground flour along the banks of the Saucon Creek, only the Ehrhart Mill, the Wagner Mill, and a third small mill, Diehl's Mill, still stand. The property was entered on the National Register of Historic Places on April 30, 1987. View the nomination form here.